NEW YORK: In the middle of her US Open final against Naomi Osaka at Arthur Ashe Stadium on Saturday, with a record-tying 24th Grand Slam singles title on the line, Serena Williams was standing on the court calling the chair umpire a thief. This is not the way it was supposed to go for Williams, 36, perhaps the greatest player her sport has seen, on a night that was supposed to be a celebration of her career and her comeback to the top of tennis a year after giving birth. After Osaka dominated the first set, another sign that this would not be a coronation for Williams came early in the second, when she received a warning for receiving help from her coach in the stands. A few games later, Williams slammed her racket and broke it. That garnered a penalty point in Osaka's favour. Still steaming from the previous warning, Williams fumed at the chair umpire and, as tensions rose on the court and in the crowd, she received a game penalty that gave Osaka a 5-3 lead, one game from the title. Within minutes, instead of trading blazing ground strokes with Osaka, a 20-year-old born in Japan who grew up idolizing her, Williams was having a heated conversation with the tournament referee. "There are men out here that do a lot worse," she said, "but because I'm a woman, because I'm a woman, you're going to take this away from me? That is not right." For Williams, this was all too familiar. She has had a series of run-ins with officials at the Open, the Grand Slam event that she has won six times but that she has also been eliminated from four times in matches with contentious officiating. Williams did not recover in time to salvage Saturday's match, which Osaka won, 6-2, 6-4. 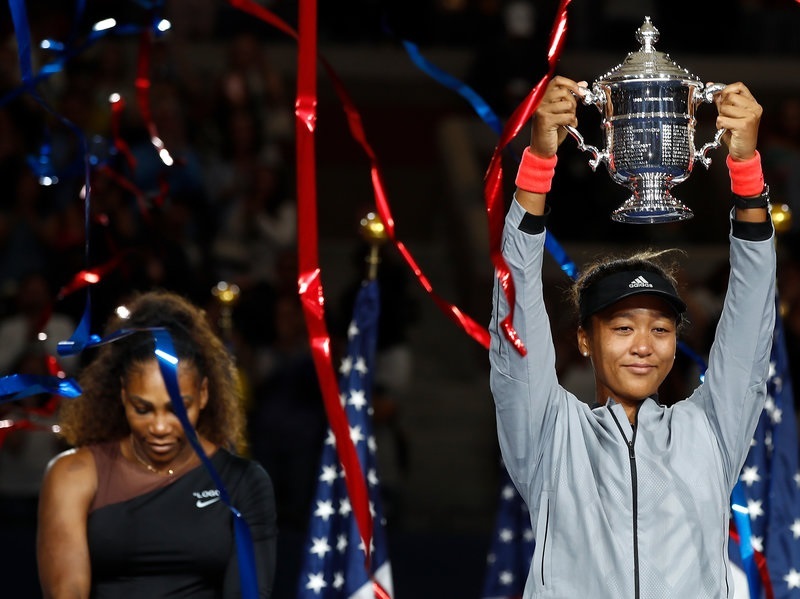 But as the boos and whistles rained down on the court during the awards ceremony, Williams resumed her role as the sport's leader, urging the fans to appreciate the first Japanese player to win a Grand Slam singles title. "Let's give everyone the credit where credit's due and let's not boo anymore," she said to the fans. Pam Shriver, a 1978 U.S. Open finalist who reported for ESPN during the final, said Williams' assertion that sexism had contributed to the harsh penalty was "in this day and age, a fair take." It was unfortunate, she said, given the significance of the match that the umpire could not restore order. "One of the main roles of an umpire is to keep order in a match, and order was lost," Shriver said. "Serena has some certain blame for it, because she couldn't let go. She felt she was wronged." On Twitter, Billie Jean King, one of the founders of the WTA Tour, supported Williams by writing: "When a woman is emotional, she's 'hysterical' and she's penalized for it. When a man does the same, he's 'outspoken' and there are no repercussions. Thank you, @serenawilliams, for calling out this double standard." Williams said she hoped that her taking a stand would enable women to be freer in the future. "That I have to go through this is just an example for the next person that has emotions, and that wants to express themselves, and wants to be a strong woman," she said. Tournaments on the women's tour allow coaches to come onto the court during changeovers to instruct players; Williams is one of the few players who has never utilized on-court coaching. At the Open, as well as at the other Grand Slam events, coaching from the stands, verbally or by signals, is not allowed. In a statement after the match, officials from the U.S. Tennis Association explained that once the chair umpire made his rulings, they were irreversible. Williams vigorously disputed each of the three rulings; the coaching violation seemed to be the most offensive to her. It was the first of her career. "I don't cheat to win; I'd rather lose," she told the chair umpire, Carlos Ramos. Williams' coach, Patrick Mouratoglou, acknowledged that he was trying to give her instructions, but said that she did not see him. Williams also seemed to indicate that she did not see the gesture that caused the violation. Shriver and Mouratoglou pointed out that umpires typically gave an unofficial warning, not a code violation, after the first glimpse of possible coaching. Mouratoglou said he understood Williams' distress at a ruling that she was trying to gain an illicit advantage. "Being called a cheater, she felt even more humiliated," Mouratoglou said. "She was thinking: 'What will my daughter think of me? They are calling me a cheater.' That's how she experienced it." Ramos, who works primarily on the men's tour, is known for being one of the strictest umpires, notably giving time violations to the slow-moving Rafael Nadal where other umpires are more lax. "I say it with sadness, but he is an umpire who scrutinizes me more and who fixates on me more," Nadal said of Ramos after a match at the French Open last year. "He also pressured me about coaching. I have respect for him, and all I ask is for that to be reciprocated." On Saturday, Williams repeatedly told Ramos she wanted an apology. "For you to attack my character is something that's wrong," Williams said during a changeover. "It's wrong. You're attacking my character. Yes, you are. You owe me an apology. You will never, ever, ever be on another court of mine as long as you live. You are the liar." She concluded, "You stole a point from me, you're a thief, too." That remark triggered the code violation for verbal abuse, which is defined in the rule book as "a statement about an official, opponent, sponsor, spectator or other person that implies dishonesty or is derogatory, insulting or otherwise abusive." The statement from tournament officials said that Ramos' decision on the verbal abuse — ultimately a judgment call (unlike the racket abuse, which was automatic) — "was final and not reviewable." In her post-match news conference, when asked if she would change anything that had happened, Williams said: "I can't sit here and say I wouldn't say he's a thief, because I thought he took a game from me. "But I've seen other men call other umpires several things. I'm here fighting for women's rights and for women's equality and for all kinds of stuff. For me to say 'thief' and for him to take a game, it made me feel like it was a sexist remark. He's never taken a game from a man because they said 'thief.'" This was not the first time in this year's tournament that officials had been called sexist. French player AlizE Cornet received an unsportsmanlike-conduct warning for taking off her top on court after she had inadvertently put it on backward; the Open changed that rule the next day after outrage over the episode. Williams' assertion that female players are policed more than male players is difficult to prove. At this year's Open, men have received 23 fines for code violations, compared with nine for women. Most of the sport's infamous brats have been men, and they have often been punished for bad behavior. John McEnroe, the best-known instigator, was frequently assessed point and game penalties during his career. He was disqualified from a fourth-round match at the 1990 Australian Open after a series of outbursts. Fabio Fognini, another serial offender, was ejected from the U.S. Open last year for making crude remarks in Italian about a female chair umpire during a first-round match. For Williams, the issues are more complicated, given her history of controversy at the tournament. In 2004, Williams lost a quarterfinal against Jennifer Capriati in large part because of a spate of erroneous overrules by chair umpire Mariana Alves. The tournament apologized to Williams, and introduced the Hawkeye review technology the next year. In 2009, in a semifinal against Kim Clijsters, Williams was called for a foot fault by lineswoman Shino Tsurubuchi and responded with a threat to shove a tennis ball down Tsurubuchi's throat. Williams was given a point penalty by chair umpire Louise Engzell, and because it was match point for Clijsters at the time, the penalty ended the match. In 2011, in the final against Samantha Stosur, Williams celebrated what she thought was a winning shot too early, and then reacted with indignation to a hindrance call assessed by chair umpire Eva Asderaki, calling her "a hater" and "unattractive inside." Williams lost that match, too. But the call Saturday about illicit coaching produced a different reaction, seeming to wound Williams more than it angered her. As she addressed the crowd in her concession speech during the trophy ceremony, Williams acknowledged her fraught track record in New York on a night when most thought she was going to be speaking about her latest landmark triumph in a sport she has ruled for nearly two decades. "I hope to continue and play here again, but we'll see," she said with a short, knowing laugh. "It's been tough for me here, but thank you so much." NEW YORK: Factbox on Serena Williams's controversial moments with officials at the US Open following her defeat to Japan's Naomi Osaka in Saturday's final. Losing her 2004 quarter-final match to Jennifer Capriati, Williams was upset by several line calls and the tournament later removed umpire Mariana Alves from officiating. The incident paved the way for using video replays in the sport. The Grand Slam Committee handed Williams an $82,500 fine and put her on two years' probation for an expletive-laced outburst at a line judge during her 2009 semi-final against Kim Clijsters. During her 2011 final against Sam Stosur, Williams was issued a code violation for arguing with the umpire, Eva Asderaki.